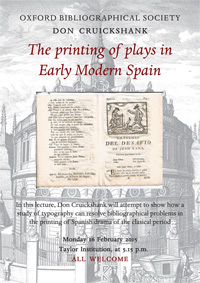 The first classical Spanish plays to be printed date from 1496. Although the classical period —the Golden Age— supposedly ended in 1700, classical plays and other theatre texts continued to be printed in the same format well into the eighteenth century: the usual cut-off point is reckoned to be 1833. The total number of recorded titles for the classical period runs into five figures. Many of these are lost, while some survive only in manuscript, but over 2000 classical items were printed. There are probably more than 10,000 editions. The Council of Castile’s attempt, in the early seventeenth century, to control the printing of plays fostered piracy and other illegalities, particularly false imprints or lack of them. These practices became widespread and have created a bibliographer’s nightmare. This paper tries to show how a study of typography can solve bibliographical problems and help us to know who wrote what and when, and when and how often it was printed.